I haven't written about sailing and the virtual world Second Life much lately but I still go on (as avatar Lex Lian) and take the occasional virtual sail in the always perfectly placid waterways of SL. But recent news of the America's Cup being extended into Second Life prompted today's post...the photos above are of the not yet released ACA32 Racer. The dots in the cockpit are "poseballs" that allow the crew to get into position (mast, trim, grinding, bow, etc) and in the first shot you can see me posing up the mast. 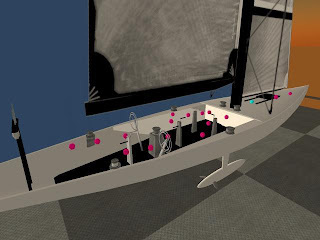 Needless to say the design and script work (code that makes the boats sail) have been developed by some of Second Life's preeminent sailors and virtual yacht architects. There is a virtual regatta planned using widely available dinghy's (called Takos) and the final eight winners of this regatta will match race the ACA32 Racers. But that's not all! Alcatel-Lucent, the official new media provider for the 32nd America's Cup, has extended its new media coverage of the event to the virtual world. 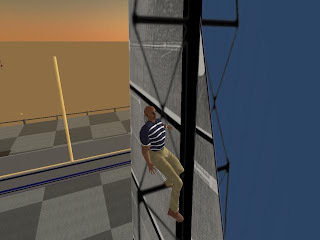 As part of its America's Cup Anywhere program a "New Media Agency" called 9th.com has been contracted to build a virtual presence named Port AmericasCupAnywhere in order to bring the 32nd America's Cup to Second Life. I'll venture to say that despite the fact that virtual worlds are far from mainstream, we are seeing history made here...and the advent of a whole new way for fans to learn, experience and even virtually participate in a major international sports event. Port AmericasCupAnywhere launches in Second Life this Friday, May 25. Some of the highlights available in-world to Second Life residents and sailing fans are listed below.